It is common that users accidently delete or format the desired files on their Android phone, such as videos, images, songs, contacts, text messages, etc. Once the data loss occurs, users are eager to find the way to get back the lost data. And in this case, getting a powerful Android recovery software can be the best method to extract the wanted files. However, there are so many recovery program on the market for users to select and how can they choose the right one? Just take it easy. In order to help users find a reliable and professional software, this article will introduce 5 high-rated recovery software for Android to them so that they can get the wanted one more quickly. 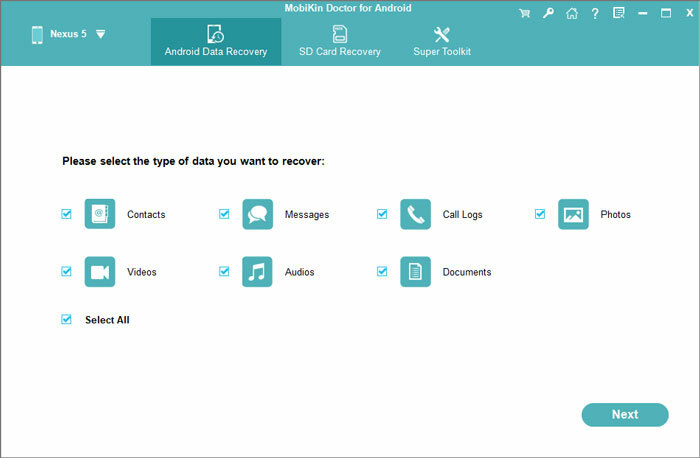 The first recovery tool you can't miss is MobiKin Doctor for Android. This program can conduct a deep scanning on your Android's internal memory and external SD card. After the scanning, you can restore the files like contacts, SMS, photos, videos, call logs and so on as you like. In addition, no any advertising or virus attack would happen during the process. - Recover various kinds of files from your Android phone easily. - Media and document can be preserved as their original format without rooting the device. - You are able to preview the detailed contents before recovery. - Support 2000+ Android device models and various Android OS. - Transfer or backup all files from Android to computer with few clicks. - You need to root your phone if you want to restore contacts, messages and call logs from your device. Wondershare Dr. Fone for Android is another recovery software that is highly praised. With it, you are capable of retrieving the lost or deleted documents, emails, media files, call history and so on from the phone simply. Besides, no matter the data are lost due to accidental deletion, broken screen, sudden fall or other situations, you can use it to get the wanted data back. - You can preview and restore the data selectively. - Transfer existing as well as erased data from Android phones and tablets. - Give a complete guide on rooting Android device and managing debugging. - Recover data both from SD card and internal memory. - The scanning speed is very slow. - It offers misleading set-up wizard. Another powerful software to extract Android files is Tenoshare Android Data Recovery. This tool can recover files from Android on Windows PC, including contacts, messages, videos, audio files, WhatsApp messages and so on. It allows users to get back their data from normal or broken Android devices. - Compatible with Window 10 and other versions. - It enables you to preview the files before recovery. - It supports all devices running on Android 1.5 and above versions. - The file formats it supports are various, such as JPG, TIFF/TIF, PNG, MP4, 3GP, AVI, WMV, ASF, MP3, AAC, AMR, DVF, etc. - Rooting device is required before recovering some types of data. - The software is not free. Eassos Android Data Recovery is a freeware that allows users to retrieve lost files caused by factory resetting, deleting, formatting, rooting, virus attack, flashing ROM and so on. And before the recovery, you are allowed to preview all recoverable files that are listed in the scan result. What's more, the recovering process is easy to operate. - Compatible with many kinds of Android device. - Recover different types of file. - It has an easy-to-use interface. - Do not support older operation systems. The last recovery software that we introduce here is also a free tool- Recuva. It is designed to recover deleted files like emails, photos, music files, videos, documents and so on from the external card or SD card od your Android phone/tablet. - The scanning and recovering speed is very high. - It contains two kinds of scan: quick scan and deep scan. - The Help Files makes the download file much smaller, which would take less space. - Not all the file types on your Android can be restored. - It cannot detect and restore the files stored in internal memory. How to Recover Data from Bricked Android?